Cape Town - South Africa's Fanie van der Merwe has qualified for the men's 100m T37 final by equalling the world record at the London Paralympics on Saturday. Van der Merwe, 26, won Heat 1 in a time of 11.52 seconds to cruise into Saturday evening's final. 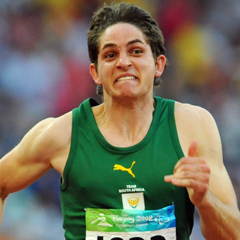 With this time he equalled his own world record, which he set in Germiston earlier this year. The two other South Africans taking part in the race, Andrea Dalle Ave and Charl du Toit, failed to reach the final. Dalle Ave ran a personal best of 12.18 seconds but finished seventh in Heat 2, while Du Toit (12.11) finished fifth in the same heat. The final takes place at 20:16 (SA time) on Saturday evening. Earlier, South African swimmer Kevin Paul set a new Paralympic record when he qualified for the men's 100m breastroke SB9 final. He won his heat in a time of 1:06.21. The final is at 18:30 (SA time) on Saturday. Other South African swimmers in action on Saturday failed to progress. Marike Naude (1:46.57) finished seventh in her heat in the women's 100m breastroke SB13, while Renette Bloem (3:37.13) finished fifth in her heat in the women's individual medley SM11.